Search.searchmabb.com is a questionable search engine and a browser hijacker. It can hijack your computer via software bundles and if it does, it will alter your browser’s settings without your knowledge. You will suddenly find it on your browser and might immediately think that your computer has been infected with malware. Thankfully, that is not the case. It’s a mere browser hijacker that is created to generate pay-per-click revenue for sponsored websites. It basically uses you to make income. While not dangerous by itself, it can expose you to unreliable content. Those redirect could lead to infected websites where malware might be hidden. You do not gain anything by allowing this hijacker to stay. You should delete Search.searchmabb.com. Why should you uninstall Search.searchmabb.com? Browser hijackers are distributed via software bundles. Essentially, Search.searchmabb.com was attached as an optional item to free software. Those optional items are hidden if you pick Default settings during freeware installation, and they install automatically. In order to prevent them from installing, you need to deselect them and that can only be done in Advanced (Custom) settings. You should always choose those settings as most freeware has something attached to it. If you do this, you would not need to remove Search.searchmabb.com or similar threats. Just like any other browser hijacker, once Search.searchmabb.com is on your computer, it will take over your browser and set itself as your homepage and new tabs. All major browsers can be affected, including Internet Explorer, Google Chrome and Mozilla Firefox. The changes are made without your explicit consent and cannot be undone without you first having to remove Search.searchmabb.com from your computer. If you use the search engine, you might think that it generates results via Yahoo but that is just to fool you into trusting it. If you pay closer attention, you will see that it says Saferbrowser Yahoo. This might not cause suspicion but you should be aware that sponsored websites will be inserted into the results. You might end up on websites that have nothing to do with what you were looking for. This is all done to generate pay-per-click income for those websites. Search.searchmabb.com might also generate advertisements for the same purpose. You should be careful not to click on anything by Search.searchmabb.com. If you were to be led to a dangerous website, you might accidentally download malware. In order to prevent damage to your computer, you should delete Search.searchmabb.com. The quickest way to uninstall Search.searchmabb.com would be to use a professional removal tool. It will take care of Search.searchmabb.com removal fully without effort from you. 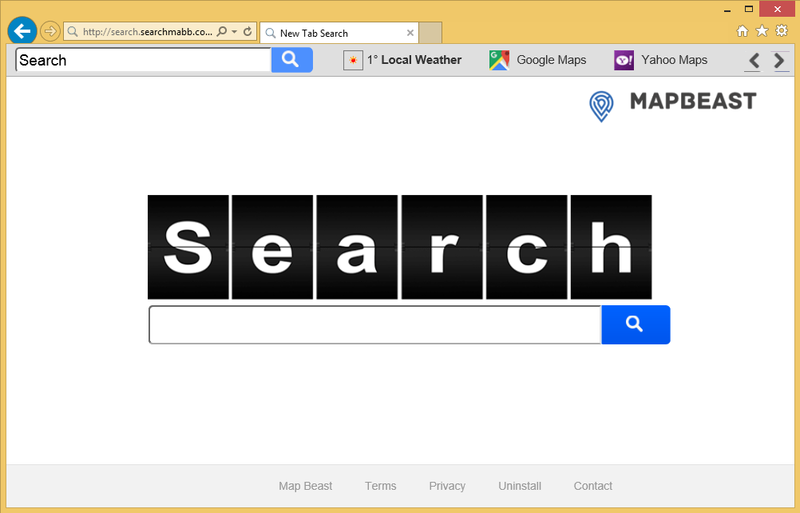 If you wish to erase Search.searchmabb.com yourself, you can do so as well. But bear in mind that you will have to locate it yourself.